Steve Clemons is a Senior Fellow and Director of the American Strategy Program at the New America Foundation, where he previously served as Executive Vice President. He is also publisher of the popular political blog, TheWashingtonNote.com. A specialist in U.S.-Asia policy and U.S. foreign policy matters as well as broad international economic and security affairs, Steve Clemons joined New America in May 1999 after serving as Executive Vice President of the Economic Strategy Institute. Mr. Clemons has also served as Senior Policy Advisor to Senator Jeff Bingaman and was the first Executive Director of the Nixon Center in Washington. In Los Angeles, Clemons served for seven years as the Executive Director of the Japan America Society of Southern California and co-founded the Japan Policy Research Institute. Steve Clemons writes frequently on foreign policy, defense, and international economic policy. His work has appeared in most of the major leading op-ed pages, journals, and magazines around the world. 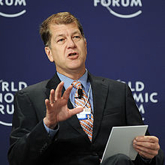 Clemons serves on the Board of Directors of the Citizens for Global Solutions Education Fund, the Starr Center for the American Experience at Washington College, and on the Clark Center for Interdisciplinary Studies of Contemporary Issues at Dickinson College.